The National Hockey League has been relatively quiet during the sports betting legalization saga, much like the NFL. PASPA has been struck down and sports betting is officially on the table. While the NBA and MLB have been aggressively lobbying for their desired version of legal sports betting, the NFL and NHL were slow to the draw. The NFL published its demands a couple of weeks ago and the NHL has now followed suit. It is important to remember that the US Supreme Court noted that Congress has the option to step in and impose regulation on the federal level should they choose to do so. The NFL said they want Congress to implement a new law in the wake of the PASPA decision. The NBA has advocated for federal legislation or a uniform “50-state solution” through state legislatures. This latter option would likely never work because getting 50 states to work out similar legislation would be impossible. It seems that the NHL has been following along with the integrity fees and data exclusivity rights portions of this whole debacle. 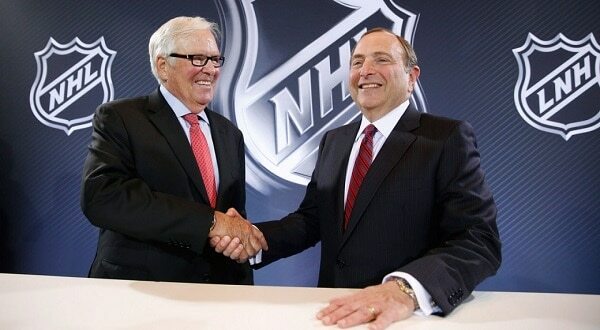 Bettman echoed certain points made by other league representatives. The NHL went against the notion of integrity fees, which have revealed themselves as royalty fees paid out to leagues. However, they are on board with the idea of being compensated for what they consider to be their intellectual property. Bettman specifically said he doesn’t question the integrity of players in the league, but he thinks it is fair for the NHL to be compensated for other businesses profiting off of their products. One interesting thing about the NHL’s conversation on this topic was the point of sponsorship. NHL Deputy Commissioner Bill Daly noted that sports betting sponsorship is certainly on the table. He said that he doesn’t expect anything significant to happen during the 2018-2019 season, but he didn’t shy away from the possibility either. Since the legal framework surrounding sports gambling has changed so much over the course of the past few weeks, it is not too farfetched to think that even more changes will surface by the end of the summer. You could very well one day see NHL teams sponsored by domestic brick-and-mortar sportsbooks. That sponsorship could extend to teams in the NFL, NBA, and MLB. The other ace in the NHL’s sleeve is their proposed player and puck tracking data, which has been difficult to get off the ground. If it ends up being useful for betting information, the league will want financial compensation for it. It is a positive sign that the NHL is coming out and addressing legal sports betting. Their demands seem to be the new status quo—shifting integrity fees to data exclusivity fees—and perhaps have a greater chance of passing. Time will tell how these demands play into any federal regulation or through state legislation.